T. Harv Eker wrote in his book Secrets of the Millionaire Mind “How you do anything is how you do everything”. This quote challenges us to step back and consider our business; to really think about if we are doing the best in all areas of our business or whether there are areas that we should focusing our attention. If you think of our business in terms of a wheel where all areas have to be at 100% in order for the wheel to run smoothly, I am sure we can think of a few areas we could improve in order to obtain the “smooth ride” we need to drive our business at the pace we want to. Personal Training as a service is often an area where things can go amiss. We have trained professionals in our businesses and we think that they should be great sales people, marketeers, retention experts as well as being highly skilled communicators and programmers. We have such high expectation for this group in our facilities that sometimes we fail to give them the tools they need to meet our expectations. There are a 8 advanced key tools, which if administered effectively, can revolutionise Personal Training as a business within your business. Health clubs often do not have a streamlined online or mobile process for members or the the club to book trainers. Trainers often manage their bookings on their phones, on spreadsheets or on a diary at the club reception. Keeping track of session credits, no shows and cancellation periods all take up administration time, which distracts the club from delivering service or from the trainer creating programmes and supporting members. Working with a company that creates these solutions and continually innovates them will save you time from attempting to build your own. 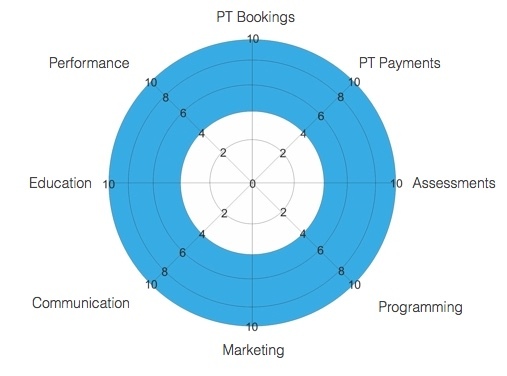 The industry is constantly evolving and so are the complexities of how and when people can make bookings for premium services. If you operate an employed model in your facility where all the PT payments are done at reception, you will appreciate the administration time this may take to firstly take the payment and then keep track of the session credits a member just purchased. Some clubs put a cost on this at 4 days per month per club. If you would that out across an estate of 35 clubs, that could be a direct cost of £250,000 just to administer the process. On the other side you may have a self-employed club model. Trainers are paid directly by the members. This simplifies the club administration process but increases the risk that you lose touch with the members and your trainers. If a trainer leaves after they have been paid for the sessions which they didn’t yet deliver, you are in a tricky spot where you might have to take a view and re-compensate your member in this situation or pay someone else to deliver this service. The self-employed model is often thought of as an easier approach to personal training models. It often creates a culture where the trainers run their own small empires and don’t feel part of the club and treat it accordingly. The club lose control of their trainers and also lose connection to their members too. Assessing members is still frequently done on the trusted clip ﬁle and captured on paper by club trainers. The member is then often given a written list of exercises and suggestions to help them achieve their goals. This trusted approach has been faithfully delivered by fitness professionals for decades. The data that has been collected is valuable not just to the member and to the club but also to anyone else that might want access to it. It contains the magic ingredients of our member’s hopes and dreams whilst highlighting where they are now so we can measure their improvements. If we keep this on paper it makes it difﬁcult to make use of this great data source. If you are doing this on paper, your chances of making a scalable solution for a multi-site operation is low. Digital solutions make life so much easier and give you immediate access to real time data. If you implement this in your clubs for the ﬁrst time, you may realise that some operational procedure changes need to be made in order to improve penetration of this essential part of member service and engagement. Just like member assessments, member programming is often done on workout cards where members keep them on the gym ﬂoor in a folder. Measuring the efﬁciency of this type of programming and how often members are engaging with it is near on impossible. Member programmes can also be used to increase your revenue spend per user if you introduce PREMIUM workouts. We ﬁnd that an average of 9% of all members will buy a workout for £0.99p. This penetration is often larger than PT penetration, and helps clubs to engage with more members on personal level. It also provides an opportunity to for clubs to devise special types of programmes based around the forever evolving equipment and techniques used in the fitness industry. When a trainer qualiﬁes to do their craft, a minimal amount of time is spent on giving them a series of skills on how to market themselves. This is often a shock when trainers ﬁrst start work that they actually have to ﬁnd people who want to engage them for their services. Giving trainers the best possible access to members is key for any trainer to grow their business. Making sure they are professionally posted and members have ease of access to view these proﬁles will allow members to learn more about team members that they see on the gym ﬂoor. Since the launch of digital notice boards, in club members now have an effective way to learn more. Reviewing analytics in our member app platform, we can see that 95% users are returning users. This gives trainers a great way to showcase their products and services to members that are constantly going back into the app each month. It also gives them an opportunity to attract the 5% of new members that looking at their profiles too. How we communicate is more than just what comes out of our mouths. How we dress; what our bio says about ourselves and how it looks on the PT PROFILE board in the club; how we fuel our bodies and exercise in the gym and much more are all communicating essential information to our potential clients. Make sure your email address is professional. Don’t use something like “hotbody69@yahoo.com”. Make sure that your Facebook / Twitter / Instagram profiles are professional. Make sure you communicate professionally with members. If members are assessed every 6 weeks, create an automatically scheduled email right after the assessment to be sent in 5 weeks’ time. Be prepared and always over deliver where possible. Just remember, we live in a generation where our private lives can often be made public through multiple media platforms, so what we do in our private lives often can be seen by our customers. The question is, are you happy to expose what you do in private? Trainers are the club’s internal customers and are often not considered in this light. If a club fails to support and engage this group, they often sabotage their business as this group generally is on the front line engaging with their members. Trainer retention is a key metric which directly affects member retention and I believe that clubs should do as much as possible to keep high performing trainers. A good way to do this is to keep them interested in learning new ways to innovate their training programmes. Giving them access to an app that contains all the education they need on a range of equipment or even tips from world class presenters is a great way to engage them. TRX created a solution to keep trainers fresh on how to use their equipment called TRX TEAM. A great way to keep on top of your game. This section is not about how far a trainer can run or how much weight they lift. It’s about measuring their performance in terms of the number of members they are engaging with, the revenue they are creating and the effect on retention each trainer has. If you lack operational transparency in your business, you miss an opportunity to anticipate challenges before they arise. If a trainer is consistently underperforming on delivering new assessments or PT sessions, then they will not be engaging the way you would like them to with your members. At some point this trainer will leave or cause some form of disruption in your business. Setting KPI’s and measuring them weekly will give you the best chance of anticipating challenges before they are problems. This can help improve trainer and member retention whilst making sure key stakeholders are happy. Early in my career I trained race car drivers for endurance motorsport, events like Le Mans 24 hour. In order to optimise and maximise the car’s performance, it requires a combination of team work, communication, best in class systems, precision execution and refinement, based on performance analysis. Fine tuning systems, processes and performance can maximise your success. I challenge you to step back and look at your Personal Training business and ask yourself if you are ready to really drive this business. Fisikal make health club management software and product education solutions for the fitness industry. Learn more.